New York, NY – December 20, 2017 – Even for today’s technology titans, public speaking can be stressful, scary – and pivotal to success. As a holiday gift, Say it Media, Inc. today announced that it will make its consumer mobile app, LikeSo: Your Personal Speech Coach, free for CES’s Living in Digital Times’ 300 presenters. Say It Media is also announcing that its AI-driven enterprise product, LikeSo Pro, will be available for first quarter, 2018. LikeSo Pro improves communications skills and levels the playing field by bringing engaging tools, collaboration and scalable one-to-one training to the enterprise market. The product offers a holistic, robust platform with an enterprise portal and more features and functions driven by voice and AI for unheard of accuracy and understanding of learning. If you are interested in receiving a demo of LikeSo: Your Personal Speech Coach or LikeSo Pro, please email us at info@sayitlikeso.com. Founded by veteran technology journalist Robin Raskin, Living in Digital Times brings together the most knowledgeable leaders and the latest innovations impacting both technology and lifestyle. It helps companies identify and act on emerging trends, create compelling company narratives, and do better business through strong network connections. Living in Digital Times produces technology conferences, exhibits and events at CES and other locations throughout the year by lifestyle verticals. Core brands include Digital Health Summit, Digital Money Forum, FitnessTech, BabyTech, Kids@Play, Family Tech Summit, TransformingEDU, FamilyTech TV, BeautyTech, Wearables and FashionWare runway show, Mobile Apps Showdown, Last Gadget Standing, Robots on the Runway and the KAPi Awards. The company also began Young Innovators to Watch awards recognizing student STEAM innovations. For more information, visit www.LivinginDigitalTimes.com and keep up with our latest news on Twitter, Linkedin and Facebook. Say It Media, Inc. was created is to advance the traditional corporate learning space by applying new technology to teach soft skills at scale. 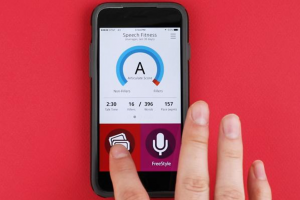 The company’s category-defining and highly popular application LikeSo: Your Personal Speech Coach is the leading speech fitness app in the Apple Store powered by a voice recognition technology, two practice modes and a proprietary scoring system. In Q1 of 2018, the company will launch AI-powered enterprise product, LikeSo Pro. LikeSo Pro improves communications skills and levels the playing field by bringing engaging tools, collaboration and scalable one-to-one training to the enterprise market for unheard of accuracy and understanding of learning. The company was founded in December 2015 by Audrey Mann Cronin, communications expert in the technology industry. Her experienced team includes CTO Jared Alessandroni, a startup veteran and innovator in corporate, AI and data management, and Strategic Advisor Mark Curtis, enterprise SaaS entrepreneur. Say It Media, Inc. is a partner of The Speech Improvement Company and National Speech & Debate Association. Visit us on Facebook, Twitter, and Instagram @ LikeSoApp or email us at info@sayitlikeso.com.